"I doubt I would have grown up to be the writer and artist I became had I not fallen in love with D’Aulaire’s Book of Greek Myths at the age of seven."—R. J. Palacio, author of Wonder. Now updated with a new cover and an afterword featuring never-before-published drawings from the sketchbook of Ingri and Edgar D'Aulaire, plus an essay about their life and work and photos from the family achive. In print for over fifty years, D'Aulaires Book of Greek Myths has introduced generations to Greek mythology—and continues to enthrall young readers. INGRI D'AULAIRE and EDGAR PARIN D'AULAIRE first met in Munich, where both were studying art. Ingri had grown up in Norway; Edgar, the son of a noted Italian portrait painter, was born in Switzerland and had lived in Paris and Florence. Shortly after their marriage, they moved to the United States and began to create the picture books that established their reputation as two of the twentieth century’s most important children’s writers and illustrators. They won the Caldecott Medal in 1940 for Abraham Lincoln. During an extended trip to Greece, they studied and sketched the countryside, the people, and the architecture and artifacts of long ago. 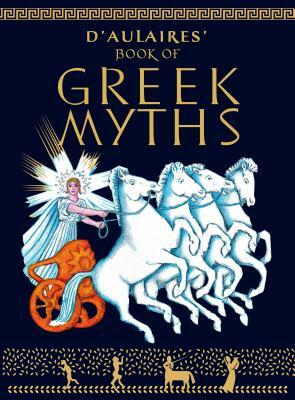 The result was D’Aulaires’ Book of Greek Myths, the standard-bearer of mythology for children since its publication in 1962. "For any child fortunate enough to have this generous book . . . the kings and heroes of ancient legend will remain forever matter-of-fact; the pictures interpret the text literally and are full of detail and witty observation."